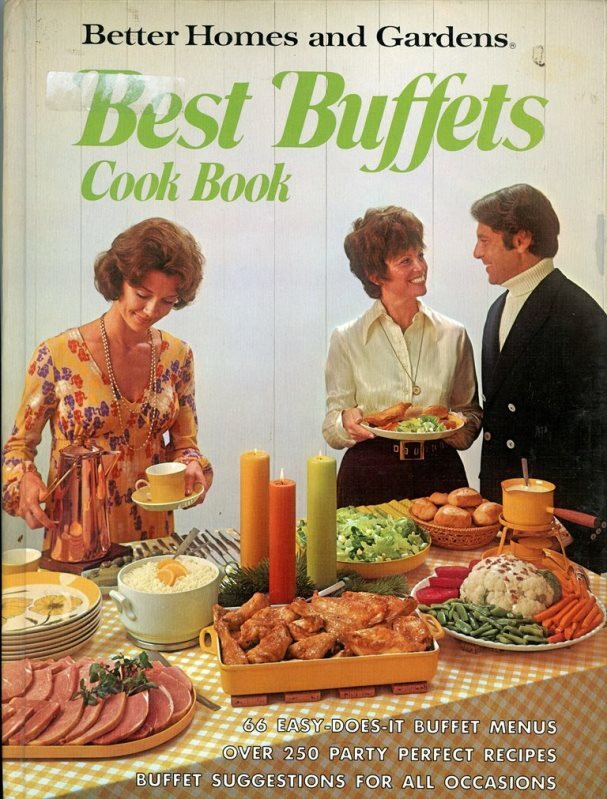 If the Brady Bunch were hosting a party, they would use this book. 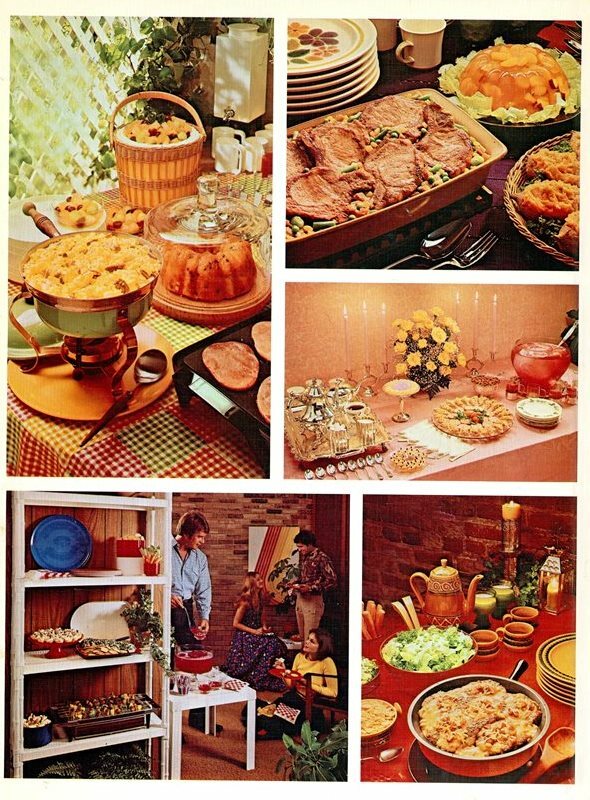 Feast your eyes on some of these delightful treats, such as Potato Chicken Bake featuring slices of American cheese and tater tots. I can just see Alice pushing these delicious meals on the whole gang. The early 1970s decor and fashion give this wonderful cookbook some extra zing. 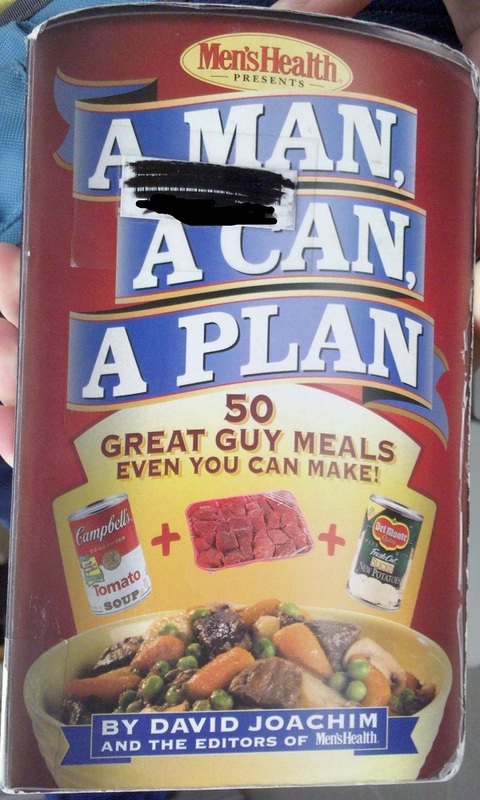 I had a co-worker tell me “Tater Tot casserole” she had made the night before. 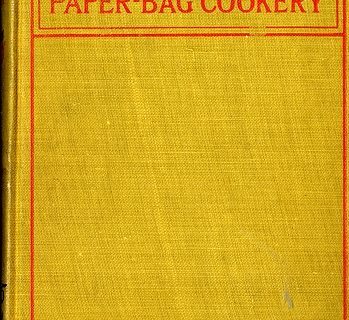 She asked me, “How do you make your Tater Toto casserole?” I broke it to her, I never have made one! She proceeded to tell me the “recipe” and how good it is. She is just 21, so I guess the meals of the 70s are back! 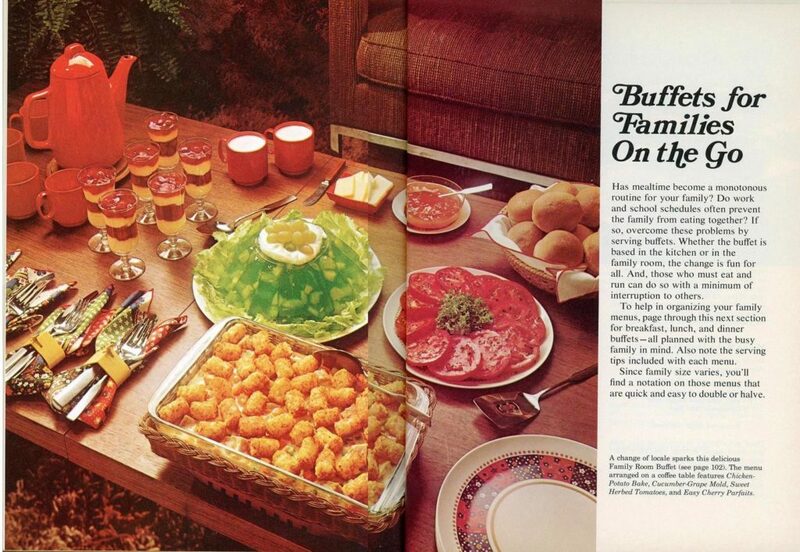 Except I was a teenager in the 70s and we NEVER had a Tater Tot casserole! Tater Tots occasionally, yes, if I begged my mother. I never heard of a tater tot casserole! Wouldn’t they go all soggy? On a side note, Trader Joe’s offers the equivalent of Tater Tots in its freezer section. They call them “Potato Tots” LOLOL! And then Tiger the lovable, shaggy, family dog jumped onto the buffet table and ate everything, and then went up to Jan’s room and threw it up all over her bed…. TBH most of the dishes shown don’t look half bad. 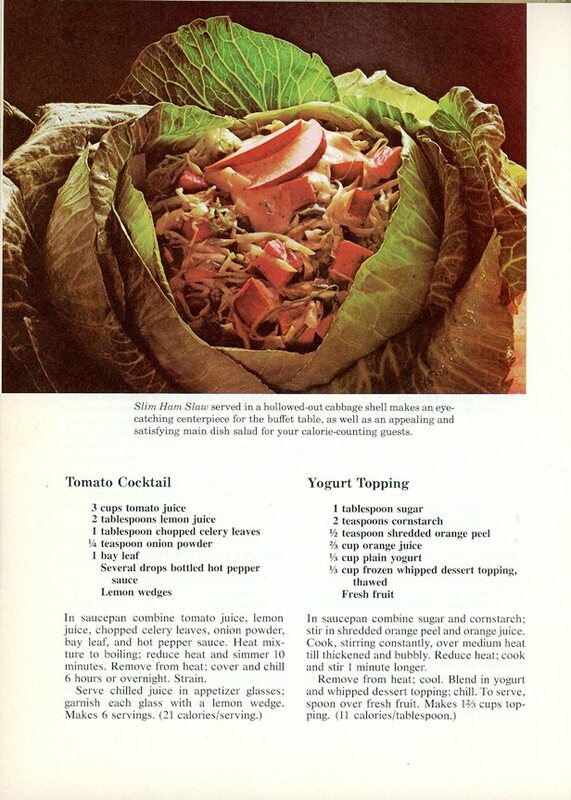 Except for the last one, it looks like a cabbage threw up. I’m trying to decide if that “Slim Ham Slaw” is really that horrifying looking, or if it’s partly because the color is faded in the illustration, making the “hollowed out cabbage shell” that horrible shade of brown. 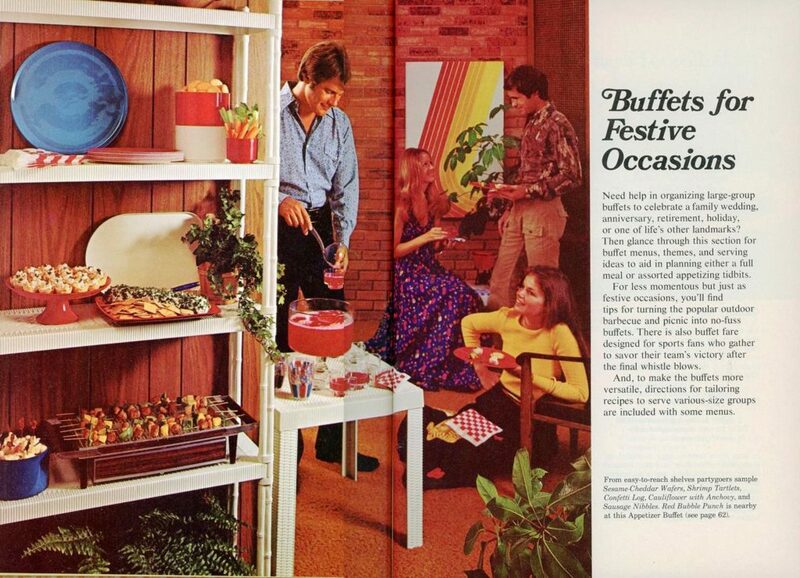 Why in the world would anyone lay out a buffet on a bunch of shelves? Am I missing something here? And shaky-looking shelves at that. I would be afraid that the big blue plate would come crashing down when the inevitable joggling of the structure occurs. Why is the woman in the yellow jumper slumped on the floor? Why is the food on the bookcase? Why would you serve a cabbage so that it looks like it’s spilling entrails? And most importantly – what the hell is a tater tot? Ah, you are clearly not from the USA (we would say “yellow sweater” or “yellow pullover” — a jumper here is a dress, usually loose-ish, without sleeves and perhaps with a low neck, that is designed to be worn with a top underneath). A tater tot is a short cylinder of fried mashed potato. Maybe it’s extruded ground potato? Yes, see https://en.wikipedia.org/wiki/Tater_tots. It’s a company’s trade name. They are pretty tasty, IMO. A local restaurant and whiskey pub actually makes an appetizer with tater tots that is one of the most scrumptious (and calorific) things I have ever tried. 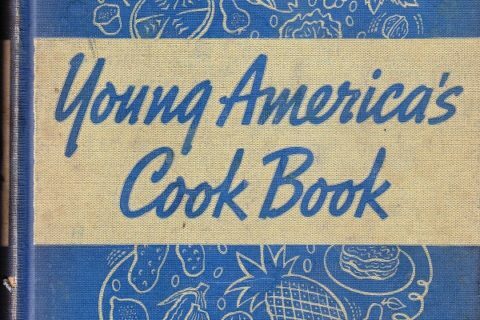 Hmm…I suggest leaving tater tots to the experts 😀 One thing about this images, though…I grew up in the 70s but don’t recall it being so yellow and red! Maybe there was a shortage of blue and green in those days. all the blue went to denim everything.